Republicans took their best shot at sinking healthcare reform over August, but it turns out that public support for their position was sort of a like a convention bounce: sharp but short-lived. 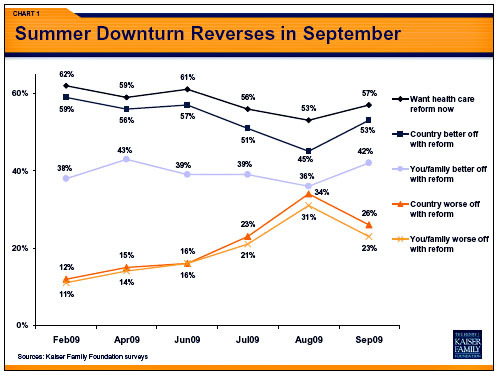 At least, that’s the takeaway from the latest Kaiser poll, which shows that support for healthcare reform has already recovered from the beating it took during the summer townhalls. This is pretty much what I expected all along, and I wouldn’t be at all surprised to see public support creep back into the low 60s if Obama and the Democrats continue to lower the temperature and work steadily to produce a solid, defensible bill with demonstrable benefits for the average consumer. With this level of support, healthcare reform is decidedly doable.